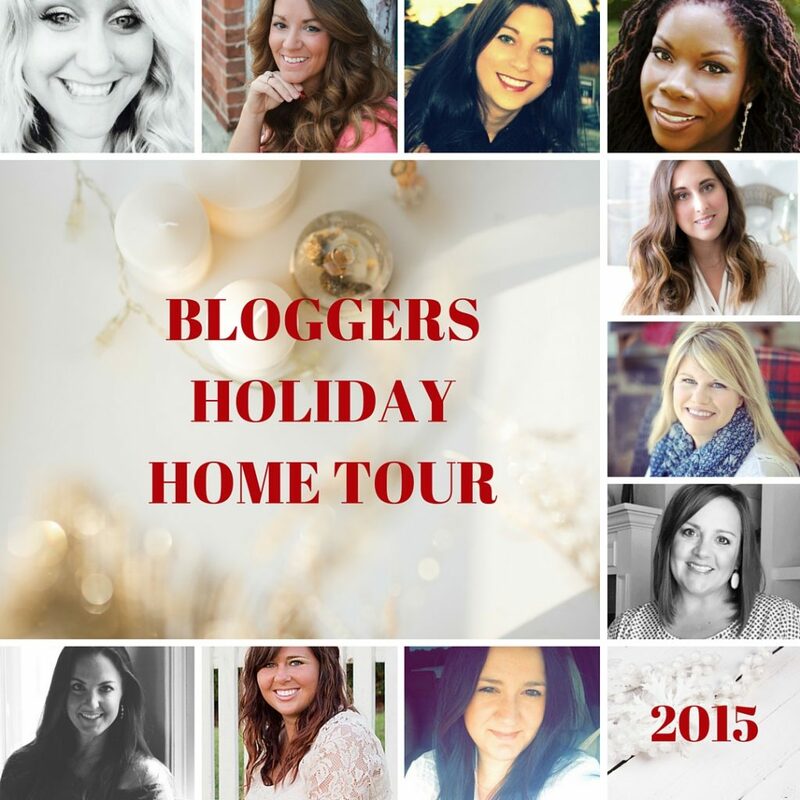 I have been anxiously waiting to share my Christmas home tour with you all! 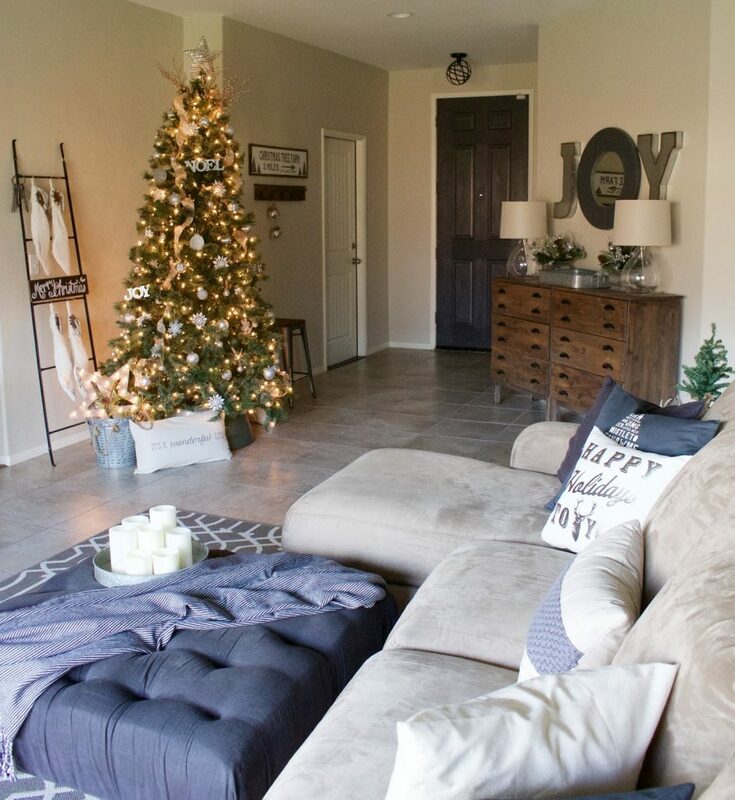 I’ve teamed up with ten other bloggers to share some rooms in our homes all decked out for the holidays. I started decorating early and enjoyed every minute. Christmas is my favorite time of the year and I just love seeing my home lit up with beauty! For this tour it was hard to pick a starting point because our floor plan is so open. I usually have a difficult time with our large entry way, but during Christmas its my favorite because it is perfect for our tree. It can be seen from every angle in our house. Adding large metal letters to my existing mirror to create JOY is one of my favorite holiday touches this year. It was so simple and made a big impact. We use this area as a drop off zone, so I needed it to still be functional and without a lot of decor. The metal letters were the perfect solution. This Christmas Tree Farm sign from Down Grace Lane is the cutest and is another simple touch to our entry way. Jingle bells from Target hang from our coat rack. Rustic trees from Art By Kelly added to my existing Home Sweet Home signs from Little Bit of Everything Inc make me smile every time I walk in from the garage. I love that I didn’t have to change anything, with simple touches its easy to decorate for Christmas. Miniature stockings from Burlap and Bows Design are so cute with faux greenery from Target. Pillows are my favorite decor accessory through out the year and Christmas time is no different. Have Yourself a Merry Little Christmas pillow from Bows and Burlap makes me want to sing Christmas music every time I walk by. The Reindeer Feed pillow from Decor Steals is perfect stuffed into crates from Michaels. I decided on a neutral theme this year for the tree with glitter ribbon, silver and galvanized ornaments and white snowflakes. I also picked up a galvanized tree skirt from Michaels this year that is more my style than a normal fabric tree skirt. A metal ladder from Decor Steals holds our stockings perfectly. It’s my solution to hanging our stockings without a fireplace and its so fun! The Merry Christmas sign is from Target’s Dollar Spot. Most of my ornaments, ribbon, and stocking accessories are from Michaels and I’ve had them for years. This year I decided to bring back my Christmas Village. I saw the rustic snowy trees at Michaels and knew they’d be perfect for creating a rustic village. It has been a few years since I’ve displayed my village, but I’ve always loved it. 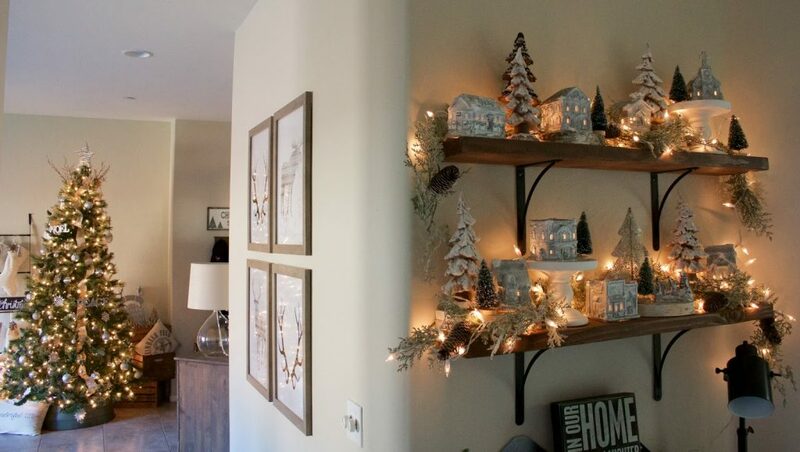 They are the white ceramic houses from Michaels that can be painted however you like, I simply painted mine silver and added touches of glitter – much cheaper than an expensive collection. They sit in my office area and my shelves were the perfect size. I created levels with candle holders, wood slices & books, and used garland to fill the empty space. It’s a great solution to the typical white fabric and creates a more rustic feel. I love that when I peak my head around the corner in the kitchen I can see both my Christmas tree and village together. It’s so magical! Deer and antler prints from Printshop Studio fill up the blank wall and I can leave them up all year or switch the prints throughout the seasons. We are teaming up for a giveaway soon on Instagram, so don’t miss it! I loved keeping my Christmas decor simple this year. I’m sure I will change up a few things over the next few weeks, but it’s something we can enjoy until after New Years without feeling overwhelmed. 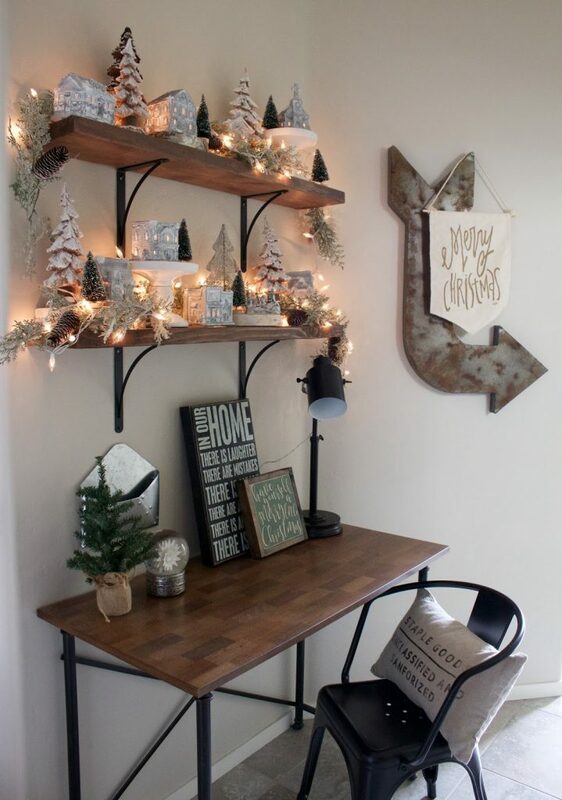 There is nothing better than a warm and cozy home decorated at Christmas time. Loved it all Allison! Your Christmas village is so pretty 🙂 Merry Christmas! Thank you Daraka! The village is my favorite too! Beautiful, friend! I love those little wooden trees in your entryway. So cute!! Thank you Iris! Aren't they fun? Loved everything, Allison! The JOY with the mirror in the middle is so fun & your tree is amazing! Great job, friend! So pretty Allison! 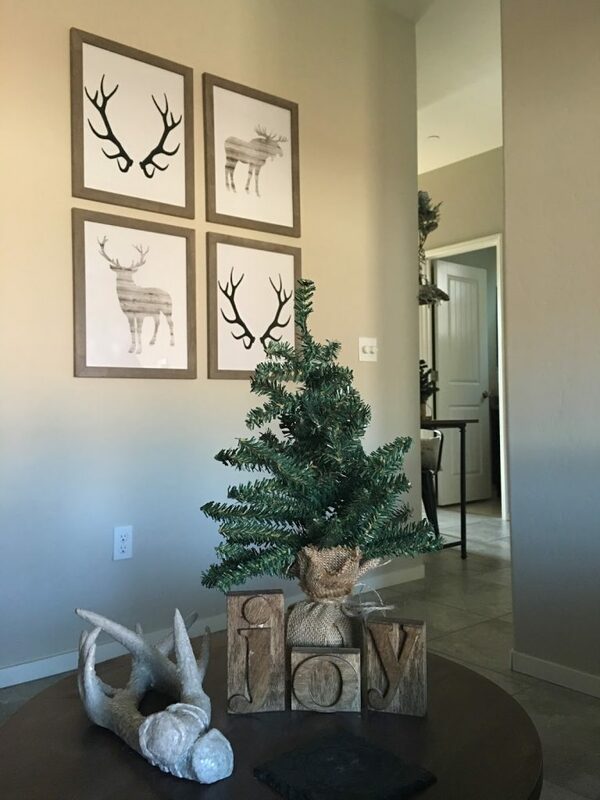 Love all your Christmas touches, especially the unique "joy" sign with your round mirror and the blanket ladder…..great job friend! Merry Christmas to you! Where are those big antlers that are on the little table from? I love your decor! So amazing! Hi Ellen, the antlers are from Michael's last year! I LOVE your tree Allison and the way you hung your stocking on the ladder! Darling idea. The J and Y added around your round mirror is awesome!! Beautiful! Thank you Sandra & thanks for letting me be a part of this! Ofcourse. Like I keep telling you on Instagram. I love everything you touch. Hi! Thank you so much Claudia! Your home is gorgeous! I love your Joy sign, so creative!